BREEAM - How not to lose credits before you start! The core of GBSPM business is in BREEAM Assessment and Training, along with Project Management, Consultation and Shadowing. Please see the services. Due to our Project Management experience GBSPM Ltd act more as BREEAM Coordinators. This approach steers the team to provide the information required to satisfy the BRE in simpler formats that suit the programme and project. Rather than just ticking BREEAM boxes, audit style that may well be cheaper at the outset. 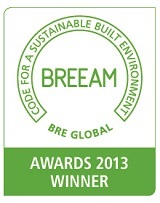 With a background in construction and years of previous BREEAM experience in building; this not only provides us with the appropriate skills to attain credits in BREEAM assessments, but we become part of the team and provide a building that works efficiently and sustainably; ensuring the best value for the client. Please see projects. We assess many BREEAM schemes, including BREEAM Healthcare, BREEAM Education, BREEAM Offices, BREEAM Retail and more. See BREEAM pages / projects. GBSPM Ltd offers a complete project management service. We can take projects from initial concept through to completion or provide services only for specific periods of the contract. GBSPM’s Project management team work closely with all parties involved; leading the delivery of the project, focusing on the Environmental and Sustainable issues. GBSPM also provide a service to shadow contractors at tender, procurement and site stages to assist them in understanding and maximising their score. We provide that extra pair of eyes and hands at the “workface” needed to pull together the required proof for the BREEAM Assessment. We are currently involved in a number of projects ranging from schools on the Isle of Scilly, hospitals in Warrington, Birmingham and Reading, to retail developments throughout the country. We also have a number of projects in our local cities of Cardiff, Bristol, Newport and Swansea. Please see the projects for further information. We also assist contractors with their WRAP requirements but also regularly attend tender review meetings, pulling together information and compiling reports to prove their claims for the recycled content of their scope of works. Please see services. GBSPM carry out training for contractors, architects and clients, covering the elements of delivering BREEAM to the optimum level. Numerous training sessions have been delivered in various parts of the country. Please see training. BRE Environmental Assessment Method (BREEAM) is a voluntary measurement rating for green buildings that was established in the UK by the Building Research Establishment.